iCollector.com will be broadcasting a great two day auction from their partner, Allard Auctions. This event will take place over two days, Saturday and Sunday, and have up for auction to the highest bidder over 700 lots. Live bidding will be available on auction day via leading edge internet bidding technology from The Live Auction Group. Absentee bidding is open now for anyone who wishes to get into the action early. Bidders can join and bid securely using any mobile smartphone, tablet, PC, or Mac. Allard Auctions have been presenting their auctions for live internet bidding on iCollector.com for several years. Throughout this time they have worked with thousands of bidders and collectors and have a most exemplary record for customer service, authenticity of material, and professionalism. Their catalogs provide excellent descriptions and beautiful photos which show the amazing level of work this auction house provides each and every day. The Big Spring Phoenix Auction 2015 is another cornerstone auction for the company. This auction will have collectible Native American and Western items such as beadwork, pottery, artwork, jewelry, and baskets. Almost every category has an offering during this sale so it will be sure to please very bidder who participates. Pottery is also a highlight of sales from Allard Auctions. On Sunday, bidders will have an eye on Lot 572. An outstanding piece of pottery will be sold to the highest bidder. 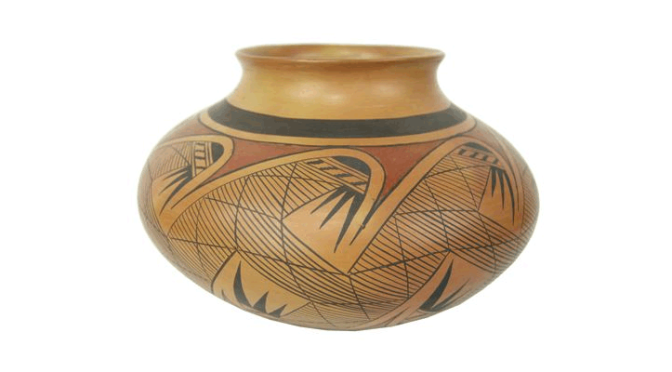 This is a Navajo Pottery Jar by award winning Lucy Leuppe McKelvey. This is from the late 1900’s and is a fantastic original design jar entitled “Whirling Rainbow Goddesses of the Windway Chant”. In very good condition, it measures 10 2/3 inches by 16 ½ inches. Collectors are encouraged to see the great collection of photos available in the online catalog and bidding will be opening at $1200. Providing outstanding auctions is commonplace for Allard Auctions. This auction is live from Mesa, Arizona on March 7th and 8th, 2015. The auctions start at 12 PM and 10AM Local time respectively. Bidders not in the area can sign up now to bid live online, or leave their best bids in the system today. Secure registration through iCollector.com is quick and simple with an email address, Google Plus, or Facebook account. 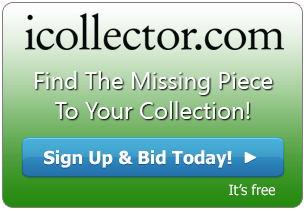 Existing iCollector.com and Allard Auction bidders are welcome to register immediately using their accounts.